Hurricane Shutters | Orlando, FL | Sun Barrier Products, Inc. Since 1988, Sun Barrier Products, Inc. has been providing our project expertise in engineering, research, and development for homes and businesses in Orlando, FL. With our quality shutters and expert installation, you can have peace of mind before, during, and after a storm. Charles T. Donaldson, the president and founder of Sun Barrier Products, Inc., is a licensed contractor. His experience with hurricane shutters goes back to the beginning of the hurricane and storm shutter industry in 1973. We know that your home’s security is important. That’s why we provide the latest and greatest in hurricane shutters, storm panels, windows, and doors. We’re based right here in Central Florida, so we understand how important it is to know your home is safe from the elements during hurricane season and all year long. For the past 29 years, the primary goal at Sun Barrier Products, Inc. has been to supply and install high-quality hurricane shutters and energy-efficient doors and windows for a reasonable price. Our expert team stays up to date on current building codes so we can ensure our customers are always receiving the best protection possible. You can rest easy knowing your home is protected because we’re dedicated to research and development to provide you with superior products. At Sun Barrier Products, Inc., we sell and install a variety of state-of-the-art hurricane shutters, including roll-down shutters, accordion shutters, and Bahama and colonial shutters. Roll-down shutters: These shutters are generally made of aluminum and are available in a variety of colors. Roll-down shutters can be motorized or operated manually. These are a popular option for homes and businesses throughout the State of Florida because they protect against hurricane-related damage and deter crime. Accordion shutters: Typically made from aluminum with an interlocking system, accordion shutters are designed to be permanently installed on your home. These shutters can be closed and locked quickly when you need weather protection or security. Accordion shutters are also an excellent option for covering large areas like patios. Bahama shutters: Bahama shutters are available in a wide range of colors to suit any aesthetic. Like roll-down and accordion shutters, they are also made of aluminum. In addition to offering hurricane protection and sun control, Bahama shutters also provide a tropical flair and can be easily adjusted to provide shade or privacy. Colonial shutters: These shutters offer a traditional look plus hurricane protection. Most styles of colonial shutters have a hinge that allows them to be closed and locked over a window. Sun Barrier Products, Inc. carries both a Cape Cod style and a Nantucket style. PGT® vinyl windows: In addition to providing protection against intruders and hurricanes, PGT® vinyl windows filter out 99% of the sun’s rays and are capable of reducing noise and lowering energy costs. PGT® sliding glass doors and French doors: With PGT® sliding glass doors or French doors, you can add an element of beauty and sophistication to your home. French doors include European-style integrated security hardware, while sliding doors include heavy-duty tandem wheels for ease of use. That’s right—no more struggling to open or close your sliding door! ProVia™ entry doors and storm doors: ProVia™ doors offer customizability, security, durability, and efficiency you won’t find anywhere else. These professional doors are available in Signet or Heritage fiberglass doors and Legacy steel doors. Each range offers a variety of options, including various styles of decorative glass, colors, and hardware. At Sun Barrier Products, Inc., we’re proud to offer the ProVia™ line of products. Whatever you need to secure your home for this hurricane season and each season to come, you can rely on Sun Barrier Products, Inc. to have what you need at a reasonable price. If you have any questions about which products would be best for your home or business, don’t hesitate to give us a call in Orlando, FL. 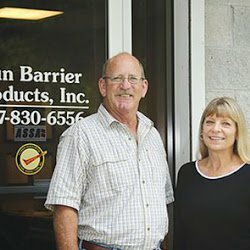 Owner, Sun Barrier Products , Inc.